TruDi™ is the first true 3D navigation platform in otolaryngology that has proprietary navigation-enabled balloons and instruments. It constructs a 3D visual of the sinuses to give ENT surgeons an accurate, simple and reliable option for their endoscopic sinus procedures. 1 It also enables the use of RELIEVA SPINPLUS® NAV, the first 3D navigation-enabled Balloon Sinuplasty System for the treatment of chronic sinusitis. 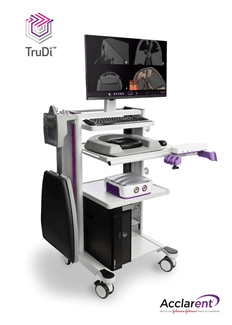 Dr. Weiss’s practice is one of only four Acclarent training sites across the country and has one of the first in-office TruDi™ image guidance systems installed anywhere. In addition to using the TruDi™ navigation system with patient procedures, Dr. Weiss also uses it in teaching other physicians how to apply 3D technology to improve treatments for sinus disease. Continuing his primary focus to reach and help patients suffering from sinus and nasal problems, Dr. Weiss stays at the forefront of advances in treatment for chronic sinusitis and other Ear Nose & Throat conditions to provide his patients with the least invasive and most effective solutions available. Let Dr. Weiss find the solution to your Ear Nose & Throat Problem.